Get a spot-free shine and quick drying time with this 2.5 gal. 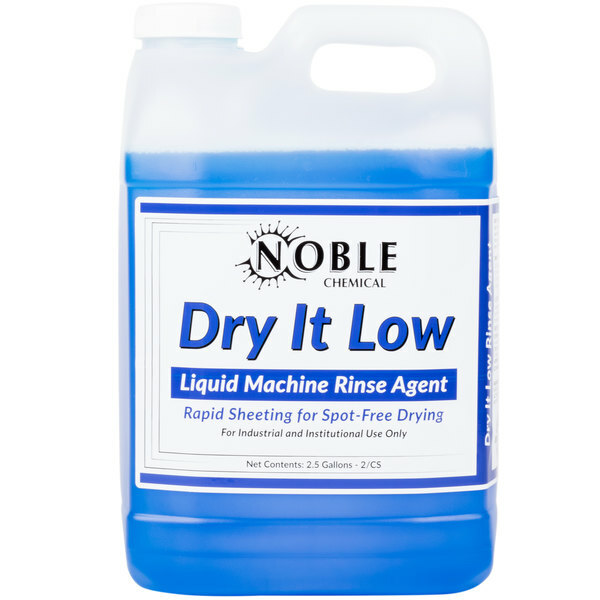 Noble Chemical Dry It low rinse aid for low temperature dish machines. The liquid rinse aid can be used in all water conditions and contains a specially formulated drying agent that is best suited for use on china, glasses, silverware, and plasticware in low temperature dish machines. For use with automatic dispensing systems, this liquid rinse will be sure brighten your restaurant dishes and impress your customers.